An Italian classic with a twist! 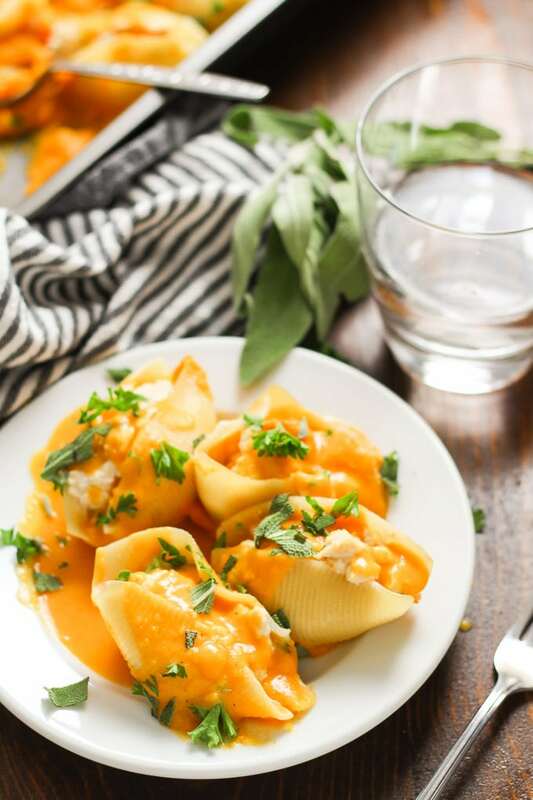 These vegan stuffed shells are bursting with creamy dairy-free ricotta and baked in velvety butternut squash sauce. Perfect for holiday dinners, or any occasion worthy of some serious vegan comfort food! Have you figured out your Thanksgiving menu yet? I hope so! With three days to go I’ve got my fingers crossed that everyone has their menu planned and ingredients purchased. I know what I’m eating, but haven’t managed to pick up all my ingredients yet. I’ve got a trip to Trader Joe’s planned later today. Pray for me. Assuming you do know what you’re eating on Thanksgiving, hang on to this recipe for Christmas, New Years, or any old day you want something special for dinner. These shells start with roasted butternut squash and onions, which will go in the shells and in the sauce. 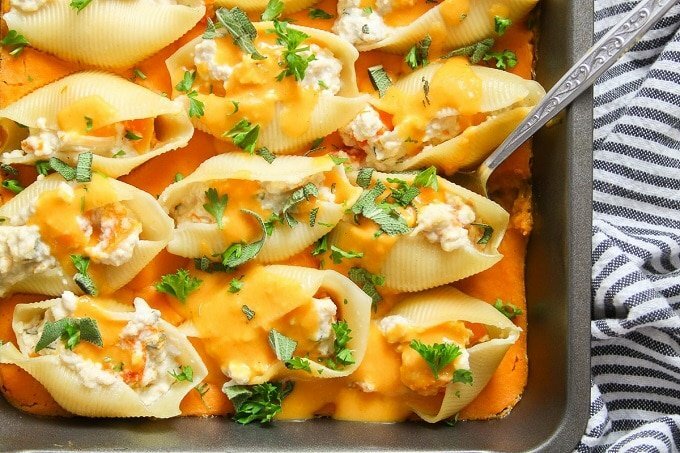 There’s so much butternut squash goodness going on here! 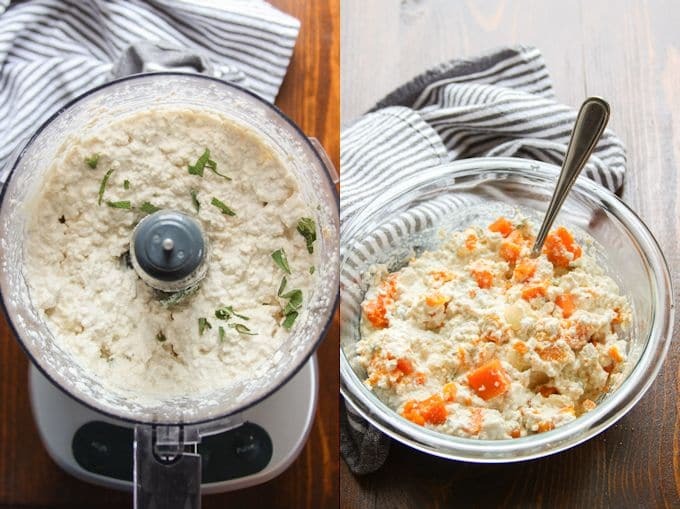 The vegan ricotta is made with my go-to mixture of cashew cream and tofu. But instead of seasoning it up with Italian spices like I normally do, I added some fresh sage to this batch. Once you’ve mixed up the ricotta in the food processor, stir in some of your roasted butternut squash and onion. Next, make the sauce. 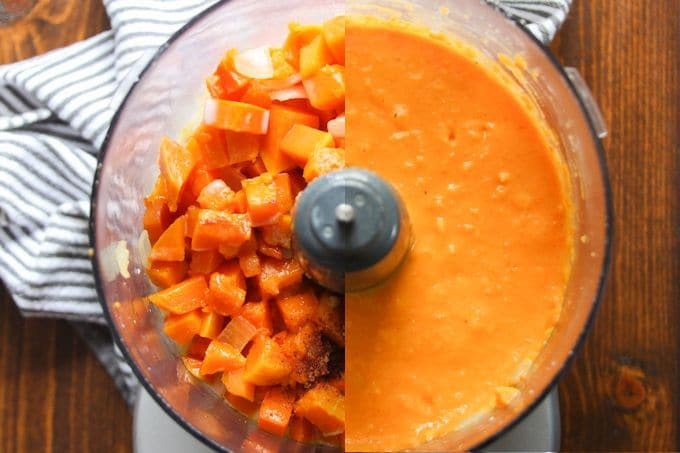 Blend up the rest of your roasted squash and onion with some non-dairy milk and a touch of nutmeg. It should be smooth, creamy, and a bit thicker than butternut squash soup. 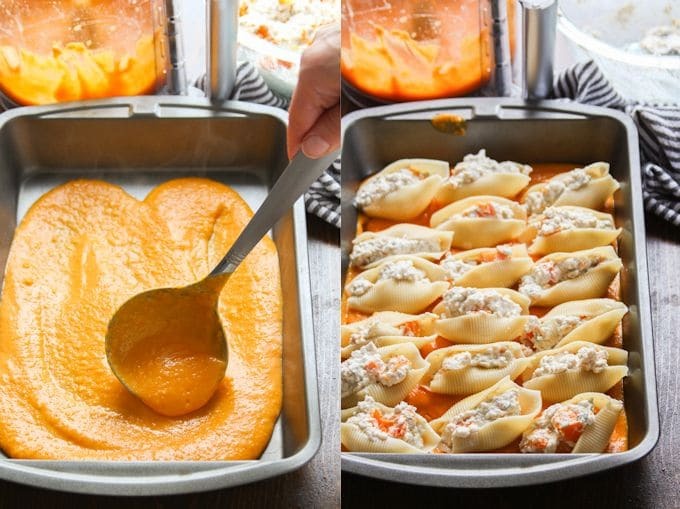 Ladle some of the sauce into a baking pan, then stuff your shells and nestle them together in the pan. Bake until hot and bubbly, then ladle the rest of your sauce on top before serving. Save time on the day of serving by making the sauce and ricotta a day in advance. The sauce will thicken up in the fridge, so you may need to thin it with a bit of non-dairy milk before assembling the dish. This recipe makes about 20 shells, but I recommend boiling a few extra because at least a couple will probably break during boiling or stuffing. Not into tofu? Leave it out and try doubling the cashews. Can’t have cashews? Skip them and double the tofu! Leftovers are freezer-friendly. Just seal them up and freeze. Then, when you’re ready to eat them, thaw and microwave or bake until they’re hot. Place the onions and squash on a large baking sheet or in a roasting pan and toss with the olive oil until coated. Roast the squash and onion for about 30 minutes, until tender, flipping about halfway through. Leave the oven on when you remove the baking sheet. While the squash and onions roast, bring a large pot of salted water to a boil. Add the pasta and cook it according to the package directions. Drain the pasta into a colander and return it to the pot. Toss with a bit of olive oil to prevent sticking. Place the cashews, onion, garlic, and 1/4 cup of milk into the bowl of a food processor fitted with an s-blade. Blend to a smooth paste, then drizzle in another 1/4 cup of milk. Break the tofu into a few chunks and add it to the food processor, along with the lemon juice, salt, and sage. Pulse until the mixture takes on a chunky, ricotta-like consistency. Transfer the ricotta to a bowl. 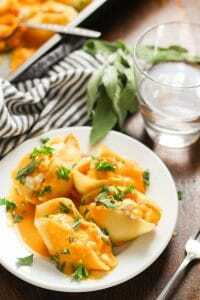 When the butternut squash and onion mixture comes out of the oven, gently stir 1 cup of it into the ricotta. Wipe out the food processor bowl fill it with the remaining butternut squash and onion mixture. Add the coconut milk, nutmeg and salt. Blend until smooth. Ladle about 2/3 of the sauce into the bottom of a 9 x 13 inch baking dish. 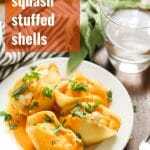 Spoon about 2 tablespoons of the ricotta mixture into each shell, then place the shells into the baking dish. Cover and bake for about 30 minutes, until heated throughout. Warm the remaining sauce up on the stove. You can thin it a bit if you like (I like to use the last little bit of coconut milk in my can for this). 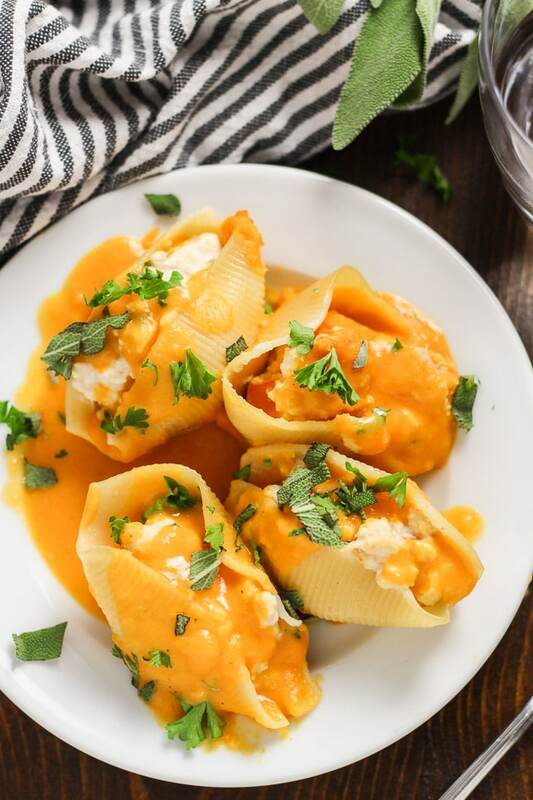 Divide the shells onto plates and top with the sauce. Garnish with parsley and sage if you like. Serve. I made this yesterday for Thanksgiving Dinner. It was deliciious! Savory with the subtle sweerness of the roasted squash. My sauce wasn’t as beautifully orange as yours–maybe needed more squash? But the recipe was great! Thanks for all your great recipes. I realy enjoy your blog. I’m so glad you enjoyed it! You probably just got light colored squash – mine was very bright! I’ve heard that the smaller squashes tend to be brighter. Thanks so much!! such a unique and delicious recipe! thanks so much for sharing! I’m glad you like it! Thanks so much Nina!